Click Project > Project Information >Status Date. Select the new status date. 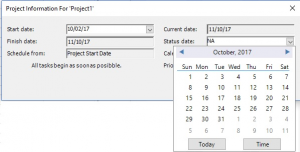 To set the status date back to the current date, either enter the current date, or enter NA in the date field. On the Gantt Chart, click Format > Gridlines. Under Line to change, pick Status Date, and then select a line style and color.